Steven Stamkos' return on Thursday comes a bit later than he originally planned, but comes at the perfect time for the Lightning. After 45 games missed and a few false starts, Steven Stamkos is set to return. The Lightning’s star center broke the news of his comeback Wednesday morning, tweeting that results on his latest X-ray were favorable enough for him to play Thursday night when Tampa Bay begins a six-game homestand against the Buffalo Sabres. Just left the doctors office. Got the green light. See you tomorrow Bolts fans. Excited to be back !! "Steven saw Lightning medical director Dr. Ira Guttentag this morning and based on the latest X-ray, a clinical exam and his functionality on and off the ice, we are pleased to announce he is cleared to play," said Lightning vice president and general manager Steve Yzerman said. "We look forward to seeing him on the ice with his teammates tomorrow night." Stamkos, who had been recovering from a broken right tibia, sustained the injury Nov. 11 in a loss to the Boston Bruins. He had 14 goals and nine assists before a metal rod was inserted into his leg a day after the incident. The return of the two-time Maurice "Rocket" Richard Trophy winner has arrived at a favorable time for Tampa Bay. Tampa Bay has stumbled out of the Olympic break, losing three of four on its most recent road trip that included stops in Nashville, Dallas, Denver and St. Louis. The Lightning were outscored 15-11 during the stretch, and after holding steady throughout much of their pre-Olympic schedule, they have slipped to fourth place in the Eastern Conference with 73 points — 13 behind the Pittsburgh Penguins. Stamkos’ return proved to be later than expected. Shortly after his injury, the 24-year-old set the Sochi Olympics as a goal. However, on Feb. 5, it was decided that he would not participate after he underwent a CT scan. Captain Marty St. Louis was named as Stamkos’ replacement on Team Canada, which claimed the gold medal in a victory over Sweden. Then on Feb. 24, the team announced that Stamkos was not cleared to play on Tampa Bay’s most recent road trip. He traveled with his teammates but the franchise exercised caution, eyeing a March 6 return for him. "Adversity is a good test, and you’re going to have to go through it in your career," Stamkos said. "And you hope that it makes you a better player and a better person for it. I have a new perspective on (my) career as a professional athlete." Now, Stamkos’ re-entry into the lineup means opportunity for the Lightning. They play 14 of their last 20 regular-season games at Tampa Bay Times Forum, a favorable schedule for their postseason push. Their star is back and not a moment too soon. 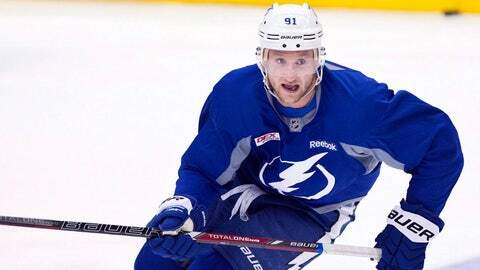 "It’s probably going to take a couple shifts just to get that confidence back," Stamkos said. "A little bump here and there, and hopefully, everything is good."